Just before my last visit to my Detroit homeland, I happened to watch a TV show called Food Wars. This show goes all around the country and pits local restaurants against one another. 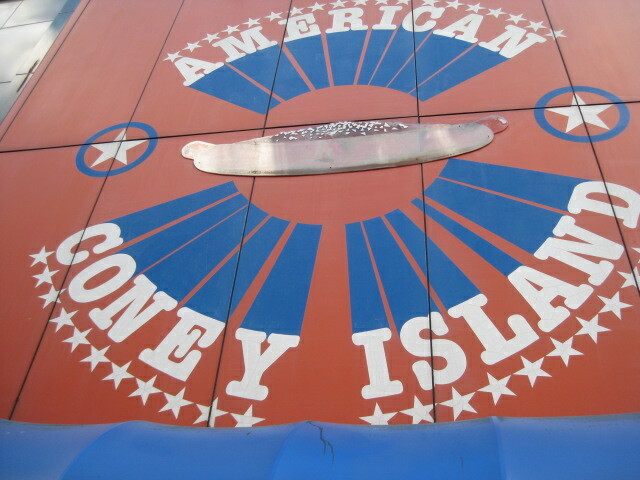 In this particular episode, Detroit’s Lafayette Coney Island and American Coney Island faced off. The two Coneys were founded in the early 1900s by brothers from Greece and both claim to be the originator of the Coney Dog, a Detroit staple. On the show, American (powered by their sweet Vidalia onions) edged out Lafayette by a vote of 3-2. But how would they fare with the Unvegan? Fortunately an impromptu tour of Detroit with a last-minute visitor brought me to the corner of Lafayette and Michigan Avenue. Wondering which Coney Dog was the unvegan king, I stepped into American Coney Island. American is set up kind of like an average small-town restaurant. There’s a long counter for ordering, a bunch of tables and a good deal of space. Since I was eating on the go, I ordered a single Coney Dog at the counter for tasting purposes. The classic Detroit Coney is prepared with delicious naturally cased dog, special Detroit chili (with Greek seasoning), onions and mustard. But they are always willing to drop the mustard and special Vidalia onions for an unvegan like me. In a minute or two, my dog was ready. I paid up the $2.50 and was ready to test out the winner of TV’s Food Wars. I bit in and it was damn good. The natural casing of the dog had a great snap to it that let you know you were biting into something special that needed just a little bit of extra protection. 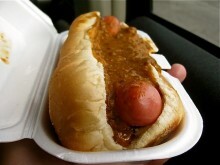 The extra bit of crispiness was a nice touch and really enhanced the overall taste of the Coney. This chili didn’t have a strong meat presence, but was still rooted in that delicious soupy Detroitiness. The seasoning, as expected, was delicious and it took me about as long to finish the dog as it did to prepare it. It was a great dog and I could have easily dropped three more and a loose burger, but with my personal food war taking place, I had to stop myself at just one. So who won? Check the scoreboard up to the right to see who won the Unvegan’s hometown (yeah, I was born in Detroit) food war. No matter what the results of my food war may be. Both of these places are definitely worth a visit.